In the life of an aviation enthusiast it is not very often that the stars align so favourably, but that they did for our journey down to the 'land of the long white cloud' in January. The trip had been planned for some time predominantly to visit family in New Zealand, with a trip to Wings over Wairarapa being on the itinerary but which was due to take place some time after Mosquito KA114 was originally scheduled to have been well on her way to owner Jerry Yagen in the States. The announcement in early December that '114 would be hanging around and appearing at Wings was highly unexpected, but extremely welcome, to say the least! Phil Whalley suffered the ordeal of twenty-four hour flights to bring this report. 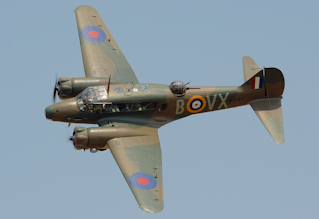 Held over the long weekend of 18-20 January the Wings over Wairarapa airshow attracted a record total crowd of around 30,000 to the small Hood Aerodrome, in Masterton, undoubtedly aided by the event's busy star item. The Mosquito's part in the show began with a de Havilland celebration which saw it join up with two Vampires - T.55 NZ-5712/ZK-RVM and T.35 A79-649/ZK-VAM - plus Venom FB.4 WE434/ZK-VNM in a diamond four formation, a vigorous solo display, and taking the lead in the finale warbird 'Balbo'. This included two P40 Kittyhawks (NZ3009 and ZK-CAG), two Spitfires (Mk.s IX PV270 and IXT MH367), F4U Corsair NZ5648 and P51 Mustang NZ2415. The Corsair and P40 NZ3009 were once a part of the OFMC 'Breitling Fighters' in the UK before Ray Hanna returned them to their (and his) native country, as both are original RNZAF airframes - indeed the P40 served with 14 Sqn at Hood in 1942. 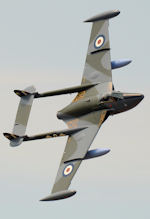 This pair - flown by Keith Skilling and Stu Goldspink - also performed a separate routine very much in the OFMC style. Avro Anson I 'K6183' - actually MH120, the world's only airworthy wartime 'Annie', and restored by Bill and Robyn Reid at Nelson on the South Island - also displayed, underlining the strength of the warbird scene in New Zealand. The Anson was displayed in great style by Dave Phillips who also took a turn at the helm of KA114. Masterton is home to The Vintage Aviator Ltd's collection of airworthy WWI aircraft and these also played a part in the show - when the weather allowed. New Zealand's climate can be as unpredictable as the UK's and this summer weekend threw up a mix of horizontal rain, freezing wind and burning sun, though thankfully the latter wasn't in short supply. The wind on the Saturday was particularly blustery which not only meant that the lighter machinery stayed tucked up in the hangars but also made photography especially testing. Nonetheless each show day offered a full and varied programme. Continuing the warbird theme the 'Roaring 40s' display team of four Harvards carried out their formations routines and also attacked the airfield in the guise of Japanese 'Zeros' in a Pacific Theatre battle scenario before being bounced by the Kittyhawks, Mustang and Corsair. In a further unique formation both of the aforementioned Vampires were joined by three stunning L-39s plus Strikemaster NZ6370. 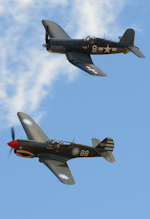 Each morning a pair of warbirds got airborne and carried out a 'Flagwave Flight' over the local area as a way of promoting the show to the neighbouring areas. 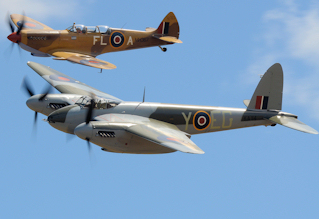 A similar event took place on the sadly cloudy Friday morning when the Mosquito was joined by a P40 and a Spitfire for a flight south over the Rimutaka Mountain range on the way to the country's capital city of Wellington. 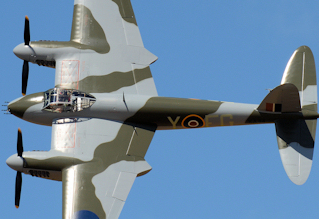 On board with Keith Skilling in the Mosquito was none other than 'Dambusters' veteran Les Munro. The New Zealander is the last remaining living pilot from that famous operation, and flew his Lancaster on missions alongside Mosquitoes as part of 617's precision targeting 'packages'. It was a wonderful move on the part of the organisers, and a very special event for all involved. With an extensive display programme which also included various Moth and Dragon variants, aerobatics, civilian display teams, water bombing, crop dusting, air racing, and an example of nearly every aircraft in service with the modern RNZAF from the well-worn Bell UH-1H 'Huey' and Kaman Seasprite to the brand new AW A109LUH and NH90, Wings over Wairarapa offered something for everyone. KA114 returned to Ardmore on the Monday after the show, with dismantling commencing the next day. 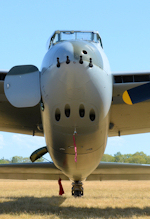 On the 15 February the containerised Mosquito left port heading for Jerry Yagen's Military Aviation Museum at Virginia Beach, USA. On a personal level it was a great privilege to have had the chance to witness one of the most beautiful of aircraft designs performing in the skies for the first time since 1996 - and quite possibly for the only time.